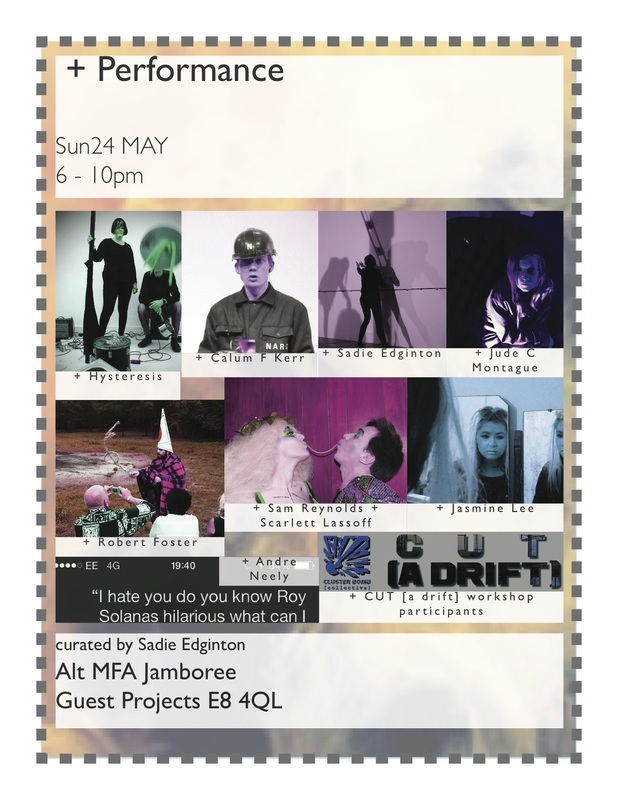 Calum F Kerr, Jude C Montague, Hysteresis (Charlotte CHW and Jason Williams), Cluster Bomb [collective] + workshop participants, Sam Reynolds, Jasmine Lee, Scarlett Lassoff, Robert Foster, Andre Neely. Curated by Sadie Edginton. Exploring the symbiotic performative exchanges between outdoor sites of Regent's Canal and the indoor gallery of Guest Projects. Suggested exercises, experience learning by forgetting. Unremember through memory negation techniques. What did 6 x 7 add up to? Who was the country’s previous leader? Static / Kinetic abstract aural formations. Body-object relations. Tableau Vivant noise composition. Auto - destruction. Jude CM, artist and writer brings to life her quirky album with Wim Oudijk, 'The Leidenfrost Effect', out this year on Folkwit /Disco Fair and other songs. Visual artist and performer interested in lucid dreaming and ritual, currently resident artist at the Roundhouse. Performing intimate action exploring the fragmented nature of memories for guest projects. 9.30pm Blue Tapes Sound art, Spoken word, Strange objects. Blue Tapes is a boutique cassette label specialising in handmade packaging, alternative process artwork, and curious audio.